Read an excerptBuy your copy today! By 2020, experts predict that more than 20 billion everyday objects will be able to capture, receive and share data via a vast, interconnected global network linked together by inexpensive sensors, GPS and ’the cloud.’ Just around the corner, real time biometric data will be automatically captured and used to learn more about the impact of lifestyle on chronic diseases and wellness, and ultimately change behavior to improve our health. A technological and social shift of this magnitude will be felt by virtually every sector of the economy, every business and every human being. It’s a story that needs to be told by someone who has more than an academic understanding of this megatrend — it needs to be told by someone who helped to create it. 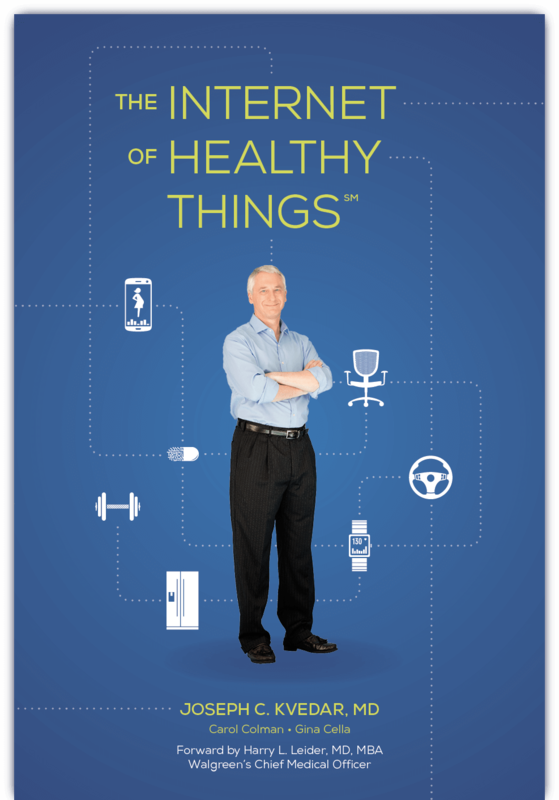 In his new book, The Internet of Healthy Things, (IoHT) connected health pioneer and visionary Dr. Joe Kvedar describes the phenomena driving this trend and the business opportunities that arise from it. The Internet of Healthy Things not only marks the twentieth anniversary of Partners HealthCare Connected Health, but the invention of a radically new way to deliver healthcare and inspire wellness. Through these past two decades, we have learned, grown, succeeded and failed. We have technologies available that were never even dreamed of just 10 years ago. And, importantly, we have a convergence of market dynamics that make connected health solutions a prime driver in changing healthcare delivery. Connected health is mainstreaming in a rapid way, but as I talk to investors, entrepreneurs and business leaders, they are at a loss for what to do with this exploding opportunity. The space feels chaotic and they worry about healthcare—the complex, long sales cycles, the liability concerns, overregulation and the like. This book takes the lessons we’ve learned over the past 20 years and brings them all into focus, providing guidance on what investments, business strategies and technology considerations are necessary to achieve order (and profit) from the chaos. Having been fortunate enough to enter this field from the ground floor, I’m proud to be among some of the earliest pioneers who helped invent it. Since then, we’ve come a very long way. When I started two decades ago, I often felt like a lone wolf howling in the wilderness. What is remarkable to me is that the vision was so clear then and, despite many setbacks over the ensuing years, my team and I never wavered from the path forward to achieve it. On top of that, the business of healthcare is changing dramatically, with providers taking on risk for population-level care and consumers buying insurance on exchanges and paying a much larger part of their bills. And all of this medical information is available to patients on the Internet. The disease burden is changing, too, as we’ve largely conquered acute illnesses, such as infections, and must now deal with the ever-growing specter of lifestyle-related, chronic silent killers such as diabetes, hypertension, high cholesterol and obesity. I may have been a bit ahead of my time when I started, but lucky for me I did not know it and did not let it deter me. Many of you in the field may have had similar experiences as well. In terms of connected health, the world is indeed catching up. There are so many innovations in this vibrant field, I would never be able to cover everything in one book. Rather I have chosen a number of examples of companies doing work that I find innovative and inspiring. The flip side to this cauldron of innovation is enough chaos to make many companies tentative about dipping a toe in the water. This book is also meant to help them find a path. We need all of you to work furiously at the challenge at hand. Healthcare delivery needs to change, becoming more efficient, more patient-centric. As I discuss in The Internet of Healthy Things, this is a multifaceted challenge with many opportunities for success. My wish is that each of you takes something from this book that will enable you to take a risk, but do so with greater confidence. It’s not just the young and idealistic who are leaping into the health space: Companies like Apple, Google, Samsung, Microsoft, Philips, IBM, Intel and even the Ford Motor Company, to name just a few, are the superstars staking claim to the consumer health space. Health probably isn’t the first thing that comes to mind when you think of Samsung, yet this tech company’s recent investment in biopharmaceuticals and biosimilars (generic versions of biologics) has analysts predicting that it will soon dominate the generic drug market. How? By adding health and wellness programs that lead to better compliance and, presumably, strong consumer loyalty. To wit, Partners HealthCare signed a groundbreaking partnership agreement earlier this year with Samsung to develop personalized digital and mobile solutions for health and wellness, including software development and a clinical research program designed to deliver tools to improve chronic disease management. But it’s not just tech giants like Samsung that are linking to the Internet of Healthy Things. In the summer of 2014, ball boys at the U.S. Open tennis tournament wore form-fitting Ralph Lauren polo shirts that measured heart rate, as well as breathing and stress levels (ball girls’ shirts were still under development). The public was so taken with the concept that Ralph Lauren debuted its PoloTech shirt for men in August 2015. Powered by Montreal-based OM Signal, the shirt teams with an app to offer “live biometrics, adaptive workouts and more.” Also keeping up with the trend is fashion designer Tory Burch, who created a jewelry line for Fitbit in 2014 that promises to “transform your tracker into a super chic accessory for work or weekend.” Furthermore, sports apparel brand Under Armour’s purchase of diet app MyFitnessPal (with its 45 million active users) and personal training app Endomondo in February 2015 could turn this sportswear icon into a wellness juggernaut. Even Victoria’s Secret is now offering a sports bra with built-in electrodes that hook up to a heart rate monitor. And it’s not only the big brands who are leading the charge into health. The lower cost of starting an IT business, from inexpensive mobile app development to pay-as-you-go cloud computing, is opening the door to disruptive newcomers and their investors. According to Rock Health, a digital health accelerator, 2014 was a banner year for connected health startups. The $2.3 billion raised in just the first quarter was more than the entire amount raised in all of 2013. And, in the first half of 2015, digital health is showing no signs of slowing down, bringing in $2.1 billion in funding, just short of the 2014 numbers. Rock Health also notes that the average deal size in 2015 was over $15 million, exceeding 2014’s $14.6 million mark. When Partners HealthCare first started developing technology-driven care delivery, the mobile health market was nonexistent. Today, the growth projections for this relatively new industry are staggering. In 2012, the global market for mobile health was valued at $1.95 billion. Experts now predict it will reach $49 billion by 2020, with about one-third of revenues coming from the United States. (The wearable device market alone is poised to hit nearly $23 billion in 2015 and is projected to exceed $173 billion by 2020, according to a 2015 Research and Markets report.) But selling devices and apps is just a small piece of the connected health market. The data footprint created by people using them is a potential gold mine. Personal tracking data contains a treasure trove of information about how people live, work, play and even think, which sheds a great deal of light on their lifestyle, including their habits and preferences. This information is an invaluable tool to marketers and advertisers who want to sell stuff to people. But it is also an incredible resource for businesses, insurers, healthcare providers and entrepreneurs—even government health ministries—who need to better understand what motivates the health consumer. And they’re willing to pay big bucks to anyone who can find useful trends in the billions of data points collected every day. In 2014, an MIT Technology Review Business Report noted that, according to McKinsey & Company, there is a huge demand for platforms and services—a business the consulting firm values at $350 billion to $400 billion annually—that make this data both accessible and actionable to consumers. Long before the internet, health and wellness trackers, apps, sensors or smartphones even existed, Joe Kvedar was creating a new model of health care delivery, moving care from the hospital or doctor’s office into the day-to-day lives of patients. Joseph C. Kvedar, MD, Vice President, Connected Health, Partners HealthCare, is leveraging personal health technologies to improve care delivery and help providers and patients better manage chronic conditions, maintain health and wellness and improve adherence, engagement and clinical outcomes. Under Dr. Kvedar’s two decades of leadership, Partners Connected Health has launched a number of innovative health tracking programs, mobile health, virtual care initiatives and clinical research programs for the more than 1.5 million patients served at Partners HealthCare-affiliated hospitals, including Brigham and Women’s Hospital and Massachusetts General Hospital, community and specialty hospitals, community health centers, home care and other health-related entities. Connected health programs address a wide range of health challenges, from heart failure, hypertension and diabetes, to prenatal care, medication adherence, cancer pain management, teen asthma and smoking cessation . Partners Connected Health has also conducted seminal studies that have demonstrated the positive impact of personal health and wellness monitoring to promote and maintain healthy behaviors. Dr. Kvedar, who is internationally recognized as a pioneer and visionary in the field of connected health, has authored over 1000 publications on the subject. He serves as a strategic advisor at Qualcomm Life, West Health Institute, Puretech Ventures and BD Technologies, and is a mentor at Blueprint Health, providing guidance and insight to developing companies. Dr. Kvedar is also a mentor at the Harvard Innovation Lab and serves as a judge for its President’s Challenge for Entrepreneurship. Based on the technology platform developed at Partners Connected Health, a personalized health technology company was launched and later acquired by a leading insurance company to support its program encouraging healthy behavior and wellness education among employee populations. In 2013, Dr. Kvedar launched Wellocracy, a leading source of impartial, easy-to-understand information on new personal “self-health” technologies like activity trackers, wireless devices and mobile apps to empower people to get and stay healthy. No one has done more to power the creation of new models of healthcare delivery than Joe Kvedar and his colleagues at Partners HealthCare…. Healthcare leaders throughout the world look to Joe and Partners Connected Health to better understand how emerging healthcare technologies can connect patients, healthcare providers and caregivers while empowering patients to take more responsibility for their health. In The Internet of Healthy Things, Joe Kvedar provides entrepreneurs, innovators, and investors with a roadmap for innovation that is grounded in practical business terms and clinical gravitas, while emphasizing the need for personalization and an understanding of human behavior. Anyone who wants to make an impact in the digital health space should read this book. Get Joe’s book. Read it. Then get (or keep) going! I am finishing my second read of The Internet of Healthy Things. What a great book! Every healthcare provider, insurer, hospital administrator and government health agency ‘powers to be’ should be reading this book. Today, we are at the cusp of technology shaping health and wellness for millions. Seeing the future of care delivery through Joe Kvedar’s eyes is an epiphany. The Internet of Healthy Things is leading the way forward and I encourage us all to get on board today. Long before anyone had even heard the term “connected health,” Joe Kvedar was hard at work inventing this new field. Based on his 20 years of experience, The Internet of Healthy Things is packed with real-world information, clinical care models and practical guidance to fuel the disruption of healthcare delivery. Joe Kvedar is one of the greatest HIT influencers of our generation. He has the rare ability to envision our future in this non-linear era and convene world-class thought leaders in Boston each year. This book captures the vision and wisdom of a landmark healthcare pioneer. Must read for anyone trying to disrupt healthcare!! I have read Eric Topol’s The Patient Will See You Now and Wachter’s The Digital Doctor and I have to say that Dr. Kvedar’s book is unique in that it does a very effective job spending appropriate time on the patient and their journey towards fully adopting virtual health. This is a great book for anyone interested in the potential of virtual health care. Dr. Kvedar, famed head of Partners Connected Health, waited 20 years before presenting the deep insights they have developed into improving health care. I was particularly impressed at the practical, realistic focus on the book: it’s not just a utopian view of a possible future, but a description of experiments and initiatives that are currently working, along with clear-sighted views on the barriers and challenges we face. The book is organized to be useful to entrepreneurs and managers of clinical institutions, ending each chapter with a list of insights. It also shows that numerous institutions that haven’t previously thought of themselves as health care providers can make significant contributions. Get the latest Connected Health news and updates sent to your inbox. Subscribe to the Partners Connected Health monthly newsletter and receive: the latest connected health news; updates on our programs and research initiatives; information on our annual Symposium; and information on related connected health events. Partners Connected Health is a leading force in the use of technology to deliver care outside of a hospital or doctor’s office. Applying personal health technologies, including remote monitoring, mobile health, personal health trackers and sensors, we are creating new solutions for empowering individuals and providers to better manage health and wellness. Partners Connected Health is affiliated with Harvard Medical School teaching hospitals, including Brigham and Women’s Hospital and Massachusetts General Hospital.